Big Hammer Fence Design has several options for displaying the views for your project. 2 Up: Displays two windows in the workspace; side-by-side. The left-hand window defaults to Plan View; the right-hand window displays multiple view tabs, as well as a dropdown menu for choosing other views. 4 Up: Displays four windows; one in each corner of the workspace. 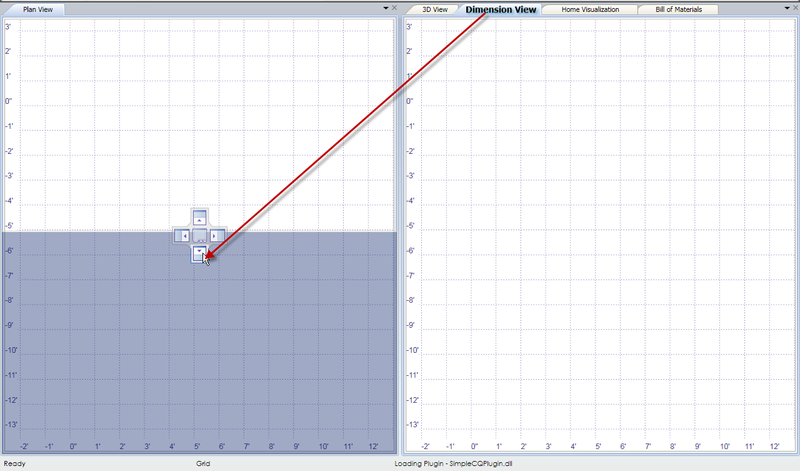 Plan View, 3D View and Dimension view are each displayed in a separate window. The lower right-hand window displays multiple view tabs, as well as a dropdown menu for choosing other views. Tabbed: Displays one window covering the entire workspace. The window displays multiple view tabs, as well as a dropdown menu for choosing other views. Plan View is the “working view” of the fence, displayed on a grid. Dimension View displays fence railing and corner posts with dimension lines. Click the 3D window and drag the mouse to change the viewing angle. The Rotate button controls 3D rotation. The Shadowing button is used to adjust the position of the sun and change how shadows are cast. The Bill of Materials shows detailed information about materials and specifications for the design. NOTE: Information displayed in the left-hand pane of the Bill of Materials view will vary depending on the software configuration. 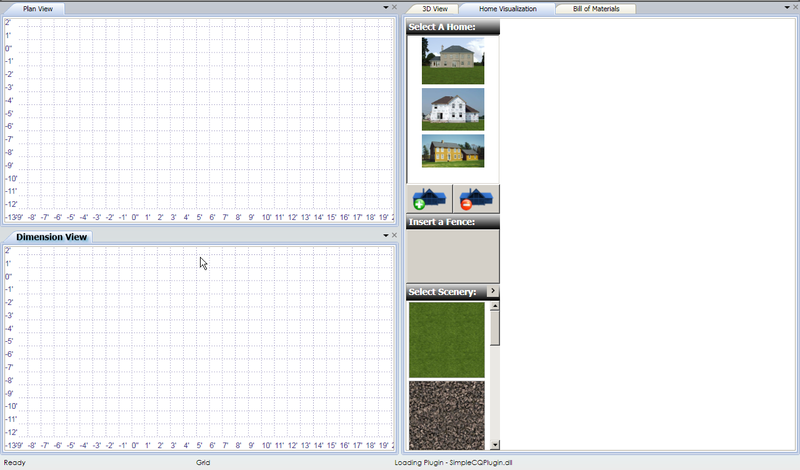 To create a Home Visualization, import a photograph of a house (.jpg, .bmp, .gif, or .png) using the Add a Home Image option from the Home Visualization pane. The photograph can also be imported from the Home Photooption in the Home ribbon. Click the fence image in the Insert a Fence section. Drag the fence into place. To proportion the fence to match the house size, stretch it using the resize handles. You can bend and reshape the fence. To add other items to the visualization, such as trees and shrubs, scroll through the list in the Select Scenerysection of the Home Visualization pane. After any object is dragged and placed into the visualization, the object can be moved, resized, or removed from the scene. To modify an object in the scene, click it to display the options. You can relocate tabs by dragging and dropping them in the workspace. Example: Dragging the tab to the bottom position creates a new window for the tab. Place the mouse pointer on the tab that you want to move. While holding the left mouse button, drag the tab until the cross appears as shown below. Place the mouse pointer on the section of the cross that corresponds with where you want to place the tab (indicated by the red line). A blue bar will be displayed to indicate where the new window will be added. Release the left mouse button and a new window will be displayed as shown below. NOTE: To restore the default view, choose one of the options (2-Up, 4-Up or Tabbed) from the Views ribbon. Selecting Grid Options from the Home ribbon displays the Setup Units and Snap Mode dialog, which allows you to set the grid spacing for Plan View, and allows you define how objects are placed on the grid. When all desired changes have been made, click the OK button. Use Grid Settings for Snap: Objects will be moved in increments to correspond with grid spacing so that they are aligned with the gridlines. 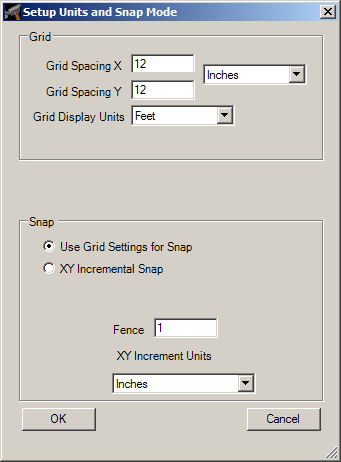 XY Incremental Snap: Objects will be moved in increments to correspond with values entered in the Fence field and in the XY Increment Units specified in the dropdown menu.